Is Trade a Plus or Minus for U.S. Growth in this Recovery? HomeBusinessIs Trade a Plus or Minus for U.S. Growth in this Recovery? Is trade a plus or minus for U.S. growth in this recovery? This is obviously an important question, given that domestic demand is likely to be stagnant for sometime. We’d like to see net exports becoming less negative, which would indicate that trade is a source of growth for the U.S. economy. However, this morning’s GDP release gave an ambiguous answer to this question. 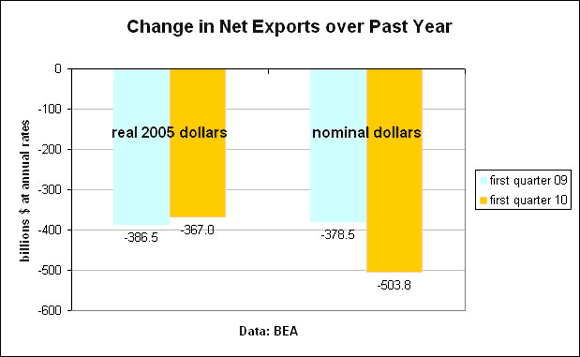 If we look at net exports of goods and services, measured in nominal dollars, the trade gap has increased over the past year from $379 billion in the first quarter of 2009 to $504 billion in the first quarter of 2010 (measured at annual rates). But if we look at the trade gap adjusting for price changes, it’s actually shrunk over the past year, from $387 billion to $367 billion. In other words, the real gap is shrinking while the nominal gap is increasing. The same pattern holds over the past ten years as well. In nominal dollars, the trade gap has increased since 2000, making it a drag on the economy. Meanwhile in real dollars the trade gap has shrunk. The apparent shrinkage of the real trade gap since 2000 is either one of the key positive facts about the U.S. economy, or an exceedingly misleading statistical illusion. Michael Mandel was BusinessWeek's chief economist from 1989-2009, where he helped direct the magazine's coverage of the domestic and global economies. Since joining BusinessWeek in 1989, he has received multiple awards for his work, including being honored as one of the 100 top U.S. business journalists of the 20th century for his coverage of the New Economy. In 2006 Mandel was named "Best Economic Journalist" by the World Leadership Forum. Mandel is the author of several books, including Rational Exuberance, The Coming Internet Depression, and The High Risk Society. Mandel holds a Ph.D. in economics from Harvard University.